Juice is an experiment in color, composition, and texture. Using a unique combination of mapping techniques and fun tropical colors, the result appears as a hand-painted abstract ode to self-similarity. Juice by creativ82 is a deviation worth writing critique upon. The use of vivid colours is blended with the acrylic-like texture, which makes the image stand out without using excessively technical-hi-def self repetition, or unnecessary spiral fetishism. Repetitive pavings are unique, have a ceramic feeling to them, in my opinion. Hot colours seem to be dominating the image, but the eye is guided with more cold colours us as green, to the left, where iterations get packed closer together. The colour palette goes very well with the shapes, colours give us the opportunity to investigate their minimal tonal changes. I somehow have the feeling that it has too much of the purple and think that a bit more of soil colours would also fit, and some parts that have pale green should have more texture within them, in order to keep the idea that every single square block is complete within itself, some of the reflections and strokes would serve well in those blocks. I really loved the blocks that have an apparent asymmetry, especially the thin dark purple line in the mid-top block, unable to encapsulte the cel totally. I am very satisfied with the originality of the piece, I think that images like these will push the frontier of fractal art, and develop our ability to use parameters as brush strokes -I mean as tools of expression, that is one of problems that the community face all times, because it is just hard to restrain the mathematics and it almost always able to create hollow eye-candies with no effort-. As the artist stated, the technique uses a mapping formula, which is something that I am not yet keen on, but gives me the idea that here image is the main purpose and technique is just a tool, any other technique would serve good as well. I think that the theme that the work expresses is a bit vague and the title does not serve well in the quest for a theme. 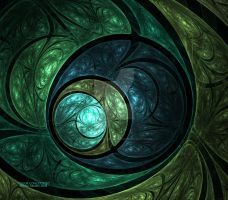 The title is the main clue for any fractal artwork since many images flout in a sea of abstract expression in the fractal community, one is generally guided by the title, if the image does not figuratively pluck a string of image of the viewer. Though the image gently rings some bells when I view it, I am not sure whether it is intentional, but it is beautiful. Though this image does not have a gigantic wow-factor, it is certainly a fractal that is a pleasure to view, and critique upon. The use of vivid colours being blended with the acrylic-like texture makes the image stand out naturally like a jade forest. Repetitive pavings, hot colours, the palette itself, and even the basic shapes seem to be dominating the image as it makes people remind themselves of being little children in a candy store buying these delictable and ingesting them. If Andy Warhol were alive today and saw this artwork, it would remind himself of those soup cans he had made in the past and make him notice how it has left a trail of such inspiration and reference throughout history. 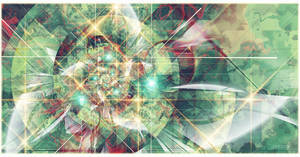 I love the simplicity of colors and patterns in this fractal. I seriously love this color palette and the texture is really successful! At first glance I thought it was acrylic. Nicely done. oh, pardon, I meant "eccentric"
If I had the money; I would buy the biggest print in a heartbeat. I love it! And that's fractal? That's fantastic! Yea, it looks hand painted! It's amazing! I would love to purchase a print of this, but the link is acting up! You can contact me at jessiwyman@gmail.com, please let me know if I can buy one! Sorry to hear you're having trouble, akjess. I'm glad to hear you like this piece though. The DA store may be having temporary difficulties but they are usually resolved quickly. Feel free to try again any time. If you still have difficulty, I'm sure the support staff at DA would be happy to help you out. This is great work. I know that your artwork has been stolen so this a class action lawsuit being held for this. This piece reminds me of either artwork to find in a lovely tiled kitchen, or the tiles themselves. Also, it made me thirsty! Lol. My juice is next to me (and it's purple). nice colors and composition! great piece! [link] Have just had this beechwood framed canvas sent to the UK. It arrived remarkably quickly and is absolutely fantastic. We love it. Thank you so much for producing such an amazing piece of art. Thanks so much for ordering one! Any chance you could share a photo of how it looks? I'd love to see it "in the real world" and on canvas. Sunshine behind the glass wall. Great! i dont want comment, speechless ! If you decide to join, I'll be able to feature your DD awarded piece,too! loooove the vibrant color. it just buzzes. I am amazed that this is a fractal. It's amazing.